All have their unique qualities. Usually solo, but sometimes with members of the Albany Running Exchange and HMRRC. Stay fit and live life! Why not? No other form of exercise makes me feel better. It gives me a chance to escape and be free while I get fresh air and enjoy the scenery. I will run as long as my body allows me. Most recently, I would say it was running the Boston Marathon in 2016. 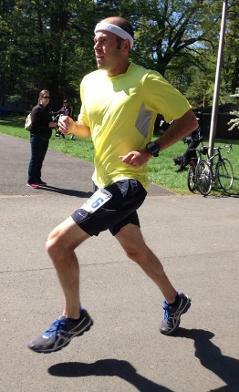 For about a 2 year period, my training focused on qualifying and running in the ultimate marathon. It was a great feeling to be fortunate enough to run this historic marathon with the best runners in the world. 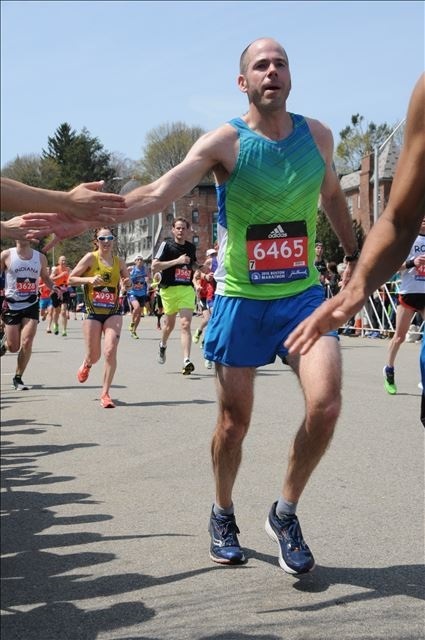 Seeing my family cheer me on at mile 25 and taking the turn on Boylston was a gratifying experience. I want to help others reach their personal running goals. I find it so rewarding to help others through their journey. I would say my best pacing experience was at the 2016 Mohawk Hudson Marathon. I had a good core of runners with me from miles 5-15. From there the group that was seeking qualifying times for Boston increased their pace a bit. I still had a core of 5 runners by mile 24 which I felt was good for the 3:35 pace group and it being a small marathon field. After the race in the parking lot, one of the ladies running with me thanked me for pacing and helping her to achieve a Boston Qualifying time. That was a great feeling! The Mohawk Hudson course is my home course, so I am very familiar with all sections of it. I enjoy a good conversation along the way if you need one. Most of all, I just like to have fun and enjoy the moment. We are all in it together! I find that running a steady pace throughout is the best and my goal is to run a negative split. If you are feeling good the last 2-3 miles and want to pick it up a bit, then go for it! Always remember to breathe, relax, and smile even through the pain. I try to remind myself everyday while I am running or exercising that I am extremely lucky to be doing this and to never take it for granted. Always be thankful.